Batcave Toy Room - Better Living Through Toy Collecting: What if Batman's Villains Were All Women? What if Batman's Villains Were All Women? Here's some pics I found of the Dark Knight's Rogues Gallery in all female versions. These pics come from Traci over at Crimson Vision Costuming. Who accepts commissions to make costumes. Check out her site for some cool pics. Below is an ensemble she put together of a female Joker. 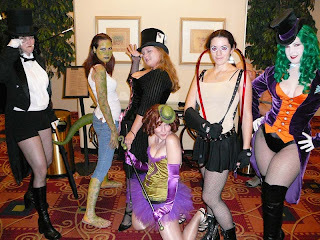 Also pictured are female versions of: The Penguin, The Riddler, The Mad Hatter, and Killer Croc. Man I love women in costumes.